Since we wrote this article on septic-safe toilet bowl cleaners, a lot of our readers have asked us for other lists of safe cleaning products to use for homes on a septic tank. Because of that we later published articles on septic-safe laundry detergent and now this list of our recommended dishwashing detergents for people living with a septic system. All of these detergents below are concentrated, low-sudsing, plant-based, contain no phosphates and are bio-degradable so they are designed to not upset the balance of your septic tank or kill the “good bacteria” that helps break down waste and keep your tank running efficiently. 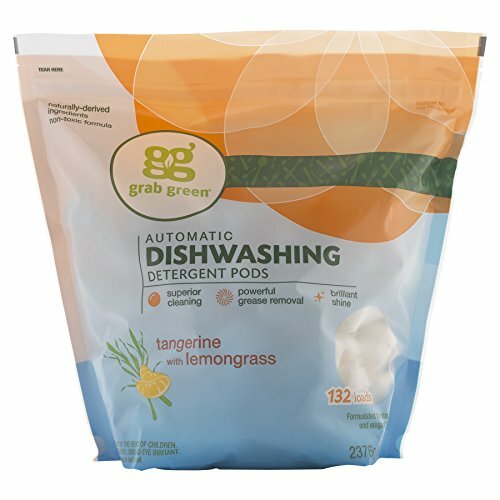 The Grab Green Natural Automatic Dishwashing Detergent Pods are great for both standard dishwashers and HE dishwashers. They are also excellent for your septic system, as they help to prevent build ups within your system due to the fact that they don’t have added chemicals and preservatives. They are even free of phosphates and dyes. They don’t do any testing on animals either, making them cruelty-free. The formula is packed into a concentrated pod that breaks down grease and cleans your dishes wonderfully. Choose from fragrance-free options, tangerine with lemongrass, thyme with fig leaf and red pear and magnolia. Each of these scents is infused with essential oils. All aspects of these dish pods are completely eco-friendly and biodegradable. If you don’t use the pods in a timely manner, they may start to harden. This can make them more difficult to dissolve in your dishwasher. Sometimes the pods may be a little puffy, so it may make it difficult for you to shut the door on the detergent spot on your dishwasher. It may not be the best at getting off food that has been really stuck on. 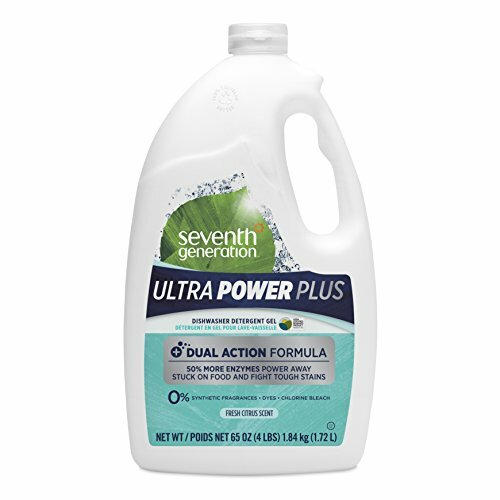 The Seventh Generation Ultra Power Plus Dishwasher Detergent gel helps to really get rid of stuck on foods and grease. It is made with a dual action formula that has micro-scrubbing enzymes that are made to cut through the toughest stuck on residue. There are no phosphates, fragrances, dyes, bleach or other harsh chemicals. It is also safe for your septic system, which helps to keep the plumbers away! 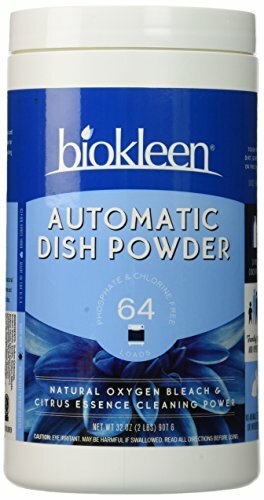 This formula gets your dishes a lot cleaner than many of the other dishwashers on the market. You may think your dishwasher is not working well, but switching detergent may be helpful. This detergent breaks down well, even in areas that have hard water. Hard water can make other dishwashing agents less efficient, but that is not the case with this one. It is made up of sustainable, plant-based ingredients. This makes it safer for the environment. Some consumers have said that it left a film in their dishwasher. This can be cleared up easily by using a dishwasher cleaner every few weeks. The detergent may seem a bit on the thin side, but that does not really affect the potency of the product. 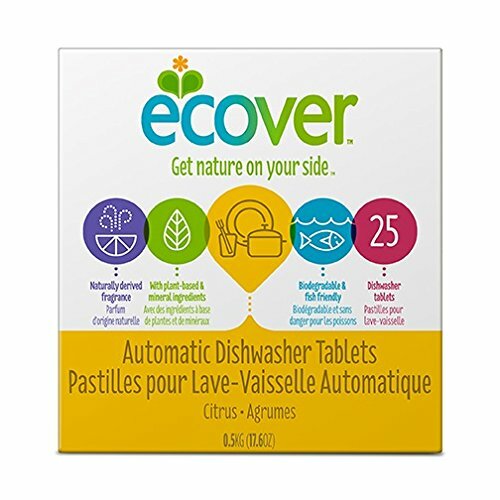 The Ecover Automatic Dishwasher soap tablets come with 25 prepackaged tabs filled with powerful dish soap. They are made up of plant-based materials and minerals that help to keep your dishes clean, without clogging up your septic system. The formula is phosphate free and biodegradable. This means that it is safe for the environment. It is also really effective when it comes to getting your dishes to come clean. The formula does not have harsh chemicals, such as chlorine. Chlorine and chemicals are often left as a residue on your dishes, but that is not the case with this formula. Ecover is a name that you can trust. They offer honest and open communication with their customers. They are also known for their ecological friendliness. Ecover does not test any of their products on animals, making it a vegan-friendly option. The pods are covered with foil, rather than thin plastic. The thin plastic pods will disintegrate in the washer, but these require you to unwrap them before putting them into your dishwasher. They have a citrus scent to them that not everyone is fond of. The good news is that it does not leave the scent behind on your dishes. 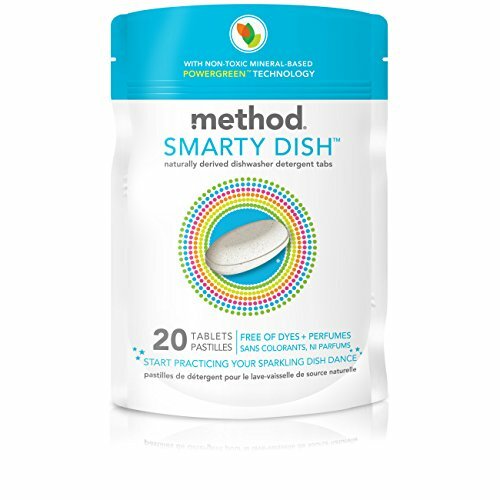 Method Smarty Dish Plus dishwasher detergent packs are individually wrapped to make it easy for you to use. It is a natural product that is made up of mineral based ingredients. It is also complete with power green technology that helps to get rid of even the stickiest of residue, and even works if you have hard water. You can get your dishes clean, without having to use harsh chemicals, such as bleach. Even the toughest of dishes can be clean when you use this detergent. It offers a triple action cleaning power that is sure to get rid of the toughest grease and grime. It is safer for your septic system than most of the other detergents on the market. It is also safe for both standard and HE dishwashers. It has been noted as leaving behind a white colored residue on your dishes. This is usually due to putting the tablet into the cutlery bin, rather than in the detergent slot. It does not have a scent to it, so if you prefer a fresh scent for your dishwasher, this may not be the one for you. Biokleen is one of the leaders in the eco-friendly cleaning supply industry. They have a few different dish soap options for you to choose from, including Dish Soap Powder and Liquid Detergent Gel. Both formulas are safe to use in both standard dishwashers and high-efficiency washers. They are both free of phosphates and chlorine, and other harsh chemicals. They also don’t have any added colors, fragrances or preservatives. Both the powder and gel detergents are great at getting out tough, stuck on foods and grease. This is thanks to the enzymes that are found in the formula. It is also made with natural citrus extracts that not only help to keep your dishes sparkling and clean but also helps to give your kitchen a great smell. The powder formula has been known to leave behind a residue on your dishes. This is why a lot of people opt for the gel formula instead. If you have hard water, it may actually leave behind a film on your dishes. The good news is that the film is not harmful and doesn’t contain any chemicals. Hopefully, this summary of septic dish detergents helped you save some time shopping. While we are a fan of the Grab Green pods for their convenience, we wanted to include gel, powders and liquid gel since we understand that everyone has preferences depending on the dishwasher you have. Any of this plant-based detergents should be mild enough not to harm the balance of your septic system with the added benefit of all being Phosphate-free. If you’d like to read other product recommendations for people living with a septic system see our septic-safe articles here.